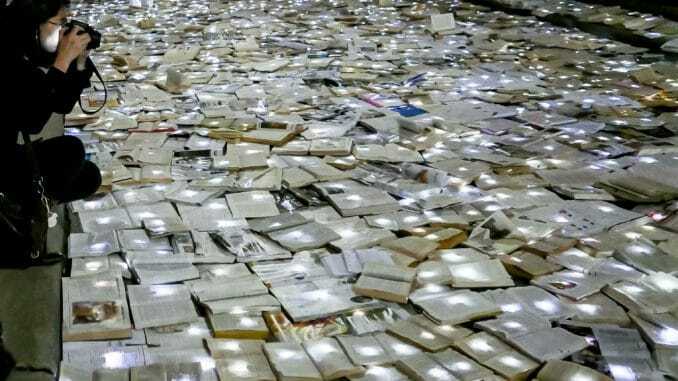 The event, which is part of the institute’s 2018-19 theme “Humanities and Environments,” will take eight days to create, and will bring together dozens of student and community volunteers who will work with the artists in the Ruthven Museums Building to prepare 10,000 books with LED lights. The books—most earmarked for recycling—have been donated in recent weeks by individuals, libraries and local organizations. The work will culminate in a one-night-only public art installation 5-11 p.m. Oct. 23, when the glowing books will “pave” Liberty Street between State and Maynard. The street will be closed to traffic during the day for installation and at night for the event. Passersby will be free to walk among the installation at their own pace, choosing books to take home in order to preserve a small piece of this interactive work. They have previously installed “Literature vs. Traffic” in Madrid, Toronto, Melbourne and New York. Ann Arbor is the first Midwestern “college town” to host the installation, according to Institute for the Humanities curator Amanda Krugliak.